On the hunt for Easter treats? We have Eggs-actly what you’re looking for so you have no Eggs-cuses not to get the perfect egg this Easter! Death By Chocolate! This cake is a handmade chocolate gateau cake. The perfect treat to bring with you visiting friends or family this Easter. Pop by Quigleys for more delicious, freshly made goodies this Easter. 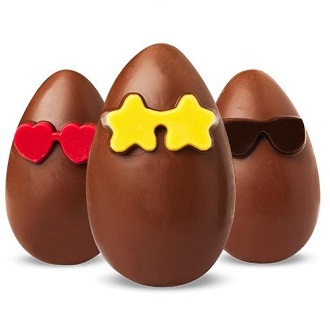 Flying Tiger is choc-a-block with quirky Easter treats. This pack of 3 eggs are only €3. Perfect for an Easter egg hunt! Planning on organising an Easter egg hunt for the little ones? This little bag of eggs is only €2. Pop in store to see their wide range of mini Easter treats and lots of Easter themed party ware. Do you want to surprise someone special this year with the biggest Easter egg in Athlone Towncentre? How about 3Kg Of Chocolate? Yes please! TK Maxx have lots of quirky eggs and Easter decor if you are hosting Easter dinner this year! Enjoy! Wishing you an Eggs-tra special Easter from Athlone Towncentre!